Big dipper was once a very popular pub slot and has now remerged as an online game, developed by the well-regarded Union Jackpots. The game is an absolute replica of a real life pub slot originally created by JPM, but without the odd smelling ale and dodgy nuts hanging around. All of the thrills and spills aren’t lost however as the slot delivers a brilliant balance of exciting gameplay and flawless graphics. Based on a truly quint essential British style fun fair, Big dipper’s bounty is accessed through a great feature trail, offering a huge array of features and bonuses to players willing to risk their pots. Utilising a standard 3-reel setup combined with the commonly used usual hi/lo hold buttons, the slot has all the making of a true favourite. 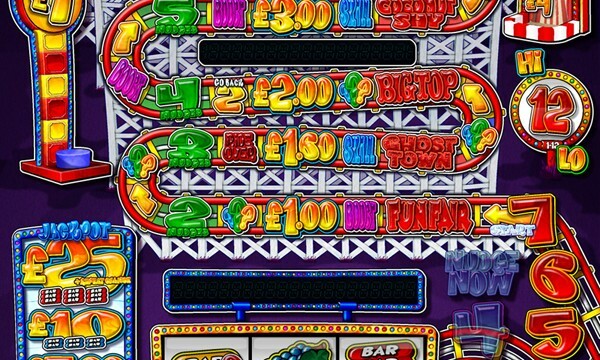 Just like the real life version, big dipper boasts a respectable jackpot of £70, but the real bounties lie within the hidden bonuses inside the feature trial, such as those you’d find on Barcrest fruit machines.Play Big Dipper at Bet 365 Games, along with other JPM titles such as 5-Liner and Turbo Gold. To access the feature, players must climb 7 strong trial via the overlaid numbers displayed on the reels. Players can trigger the slots main feature by successfully completing the trail to position 7 or hitting 3 overlaid numbers in a row on the screen. During the feature game you will always enter at position 7 of the trail. You will then need to spin the Hi-Lo reel to determine how many positions on the trail you get to move. If by chance you land on a nudge, cash award or feature square you will always to Hi-Lo is you are feeling extra lucky. If you win the Hi-Lo feature you will move up to the next feature, cash award or nudge. The feature board consists of 55 position trail to ends that offers more cash awards, nudges, boost squares, back to start position, go back squares, mystery awards, lose squares and skill stops. The slot differs from traditional feature board type games as the trial is one continuous streak where there is no going back once committed, meaning every roll of the dice makes the game that bit more exhilarating. If you enjoy slots with bonus features like this, check out our Deal or No Deal review or Rainbow Riches review.